Ryan Manning was again on the spot for Rotherham as he fired in two penalties to complete a memorable comeback 2-1 win against Swansea. The Welsh side were on top for most of the match and led through Ollie McBurnie, but made the long journey home pointless thanks to Manning's double coolness in the space of eight second-half minutes. The QPR loanee came off the bench and earned his side their first win in nine games. Swansea's early good work was coming down the left hand side and it paid off after 25 minutes when Daniel James raced to the byline and crossed for McBurnie to slot past Marek Rodak. James had a half chance to double their advantage but he snatched at Connor Roberts' cross and blazed over the crossbar. Rodak was again called into action early in the second period with Leroy Fer shooting from Roberts's centre. Jay Fulton then fired over the top after breaking through unchallenged from midfield before Bersant Celina shot narrowly wide. Manning's long-range free-kick was palmed out by Kristoffer Nordfeldt as the Millers finally began to stir. And they were handed a way back into the match out of nowhere when Nordfeldt tangled with substitute Jamie Proctor at the back post and forced referee Tony Harrington into awarding a 78th-minute penalty. Manning stepped up for the third time this season and slotted the ball past the goalkeeper. He was to make it four on 86 mintues after Fer was deemed to have handled Will Vaulks' powerful effort. The Irishman remained calm and smashed into the top corner to hand Rotherham what could be a valuable three points they scarcely deserved. 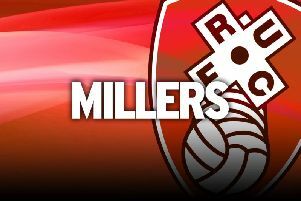 Rotherham: Rodak, Vyner, Robertson, Ajayi, Mattock, Taylor (Newell, 62), Towell (Proctor, 75), Vaulks, Vassell (Manning, 46), Williams, Smith. Unused: Price, Wood, Forde, Wiles. Swansea: Nordfelt, Naughton (McKay, 90), van der Hoorn, Rodon, Grimes, Roberts, Celina, Fer, Fulton (Baker-Richardson,90), James, McBurnie. Unused: Mulder, Olsson, Carter-Vickers, Asoro, McKay, Dhanda. Attendance: 9,006 (778 from Swansea).